Find a Robbie Williams Tribute Act for hire near you in minutes! Option 1. 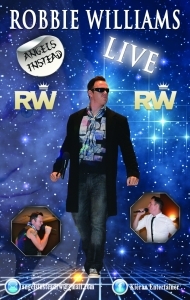 Enter your event location below & contact a Robbie Williams Tribute Act directly! Option 2. Request multiple quotes from available Robbie Williams Tribute Acts Get Quotes! Option 3. Read information & advice on hiring Robbie Williams Tribute Acts Read Advice! WANT TO KNOW MORE ABOUT Robbie Williams TRIBUTE ACTs? Read on for the most comprehensive guide to booking a Robbie Williams Tribute Act, including how much a Robbie Williams Tribute Act costs, exactly what they will do at your event, plus tips, advice and information to help make your event one to remember! What exactly will a Robbie Williams TRIBUTE ACT do at your event? When you hire a Robbie Williams Tribute Act for your event, you will get a professional singer who will be able to emulate Robbie’s vocals, charm, wit and stage mannerisms, making it seem like that you’re at a real Robbie Williams show! Robbie Williams has been a household name since the 1990’s, when he was a part of the hugely successful boyband, Take That. Since Robbie left Take That in 1995, he has managed to carve out a dazzling solo career that has seen him reach the top of the charts in many countries! Robbie Williams is one of the UK’s best ever showmen! When you attend a Robbie Williams show, you can expect dancing, singing, crowd participation and a splash of wit! The same can be said for a Robbie Williams Tribute Act! With a Robbie Williams impersonator, you can expect to hear classic Robbie songs which will include; ‘Angels’, ‘Feel’, ‘She’s the One’, ‘Rock DJ’, ‘Candy’, ‘Let me Entertain You’, ‘Come Undone’, ‘Supreme’, ’Sexed Up’, ‘Millennium’, ‘Kids’ and many, many more! Book a Robbie Williams Tribute Act and you can expect to hear songs from his classic albums including ‘Life Thru a Lens’, ‘Escapology’, ‘I’ve Been Expecting You’, ‘Sing When You’re Winning’, ‘Swing When You’re Winning’, ‘Intensive Care’, ‘Reality Killed the Video Star’ amongst others! The great thing about the back catalogue of Robbie Williams’ illustrious career, is that you can expect a host of party anthems alongside a dash of some of the most personal and tender love songs ever. Mainly, a Robbie Williams Tribute Act will entertain you and your audience with a fantastic live show that will put the wow factor into celebrations and impress your guests, whatever their entertainment tastes may be. What event types are Robbie Williams Tribute ACTs hired for? Hire a Robbie Williams impersonator for your wedding ceremony, and you will get a talented singer who will sing your favourite Robbie Williams songs live, in front of the wedding guests! The Robbie Williams Act can be hired to perform with a live backing band as the wedding guests are pouring into the wedding ceremony venue. To set the mood, we would suggest Robbie songs such as ‘Feel’ or ’She’s the One’. The bridal entrance is one of the most memorable moments of the whole wedding day and indeed, one of the most memorable moments of the bride and groom’s life. What better way to soundtrack the entrance of the bride than by hiring a Robbie Williams impersonator to sing his way through one of the most sweetest songs of all time, ‘Angels’. Released in 1997 on Robbie’s debut album; ‘Life Thru a Lens’, ‘Angels’ still remains the highpoint of any Robbie Williams’ live show. It’s a beautiful crossover song and the lyrics would be extremely fitting for a wedding ceremony. We can guarantee that there will not be a dry eye in the venue if the Robbie Williams Tribute Act is performing ‘Angels!’. Book a Robbie Williams impersonator for the wedding drinks reception and you might be surprised at how many hits Robbie has actually had! The Robbie Williams Tribute Act can be set up to perform stripped down versions of the best of Robbie Williams, which may include ‘Come Undone’, ‘Something Beautiful’, ’Feel’ and ‘Millennium’, Robbie Williams is also known for his love of Swing music and released the excellent Swing and Big Band covers album ‘Swing When You’re Winning’ in 2001. The Robbie Williams Tribute Act can therefore include Swing covers such as ‘Mack the Knife’, ‘Beyond the Sea’ and ‘Ain’t that a Kick in the Head’, amongst many others. All of which would be idea for the wedding drinks reception! The wedding Breakfast would be a perfect time to hire a Robbie Williams impersonator! The reason being is that Robbie is an artist who appeals to everyone! The teenagers of the 1990’s will remember Robbie as the cheeky one from Take That and for the sparkling ‘Angels’ song, and the younger generation will know Robbie for more recent hits such as ‘Bodies’ and ‘Candy’. The hired Robbie Act can tailor the setlist to suit you and your tastes. Whether you would prefer an out and out rockier Robbie set, or whether you would like to hear the love songs of Robbie Williams, you can use our personal messaging service to inform the tribute act of your tastes. Hire a Robbie Williams Tribute Act for your wedding evening reception entertainment and you will have an impersonator who will be dedicated to entertaining you! Robbie Williams has hoards of party anthems that would be great at the wedding evening drinks party! For getting the wedding party started, we would advise for the Robbie Williams lookalike to run through hits such as ‘Rock DJ’, ‘Feel’, ‘Let Love be your Energy’, ‘Bodies’, ‘Candy’ and the juggernaut that is ‘Let Me Entertain You!’. The Robbie Williams Act can then perform for the married couple’s first dance. For this very personal moment, we would advise to request a Robbie love song such as ‘Angels’, ‘She’s the One’, or the glittering rendition of ‘Somethin’ Stupid’, which Robbie covered with Nicole Kidman. When you hire a Robbie Williams Covers Act, you can also expect to hear a few live versions of Take That’s best hits of the 1990’s as well as Robbie’s more recent hits. The long career of Robbie Williams is one of the many reasons why a Robbie Williams Tribute Act would be ideal for a corporate event such as a trade show or a product launch! Robbie’s music is very uplifting and personal to the public, hence why a Robbie Williams Tribute Act would be ideal to boost interest your product! If you are searching for a live musical act for your work party, then hire a Robbie Williams Tribute Act to bond your workforce! Colleagues and clients alike will enjoy the range of Robbie’s songs and everybody will undoubtedly love the show which will be performed by a true professional! You may be looking for the perfect tribute act for your 1990’s themed party?! As Robbie Williams practically owned the 1990’s music charts, we strongly advise to hire a Robbie Williams Tribute Act to run through the best of Robbie at your 1990's themed party! How much do Robbie Williams tribute ACTS cost to hire? Our simple to use entertainment directory allows you to firstly search for the best Robbie Williams Tribute Acts who are local (or travel to your area) and then via the contact form you may message them directly to enquire for a no obligation quote to perform at your event. Some acts will also add a rough price guide to their profile for your convenience. What are the usual set formats and performance lengthS for Robbie Williams tribute acts? A Robbie Williams Tribute Act can tailor their performance times to suit you and your event, however, on average, a professional Robbie Williams Tribute Act will perform for two 45 minutes sets. How much space will a Robbie Williams tribute act need at your event? If your Robbie Williams Tribute Act comes as part of a full band, then you will need space for a full band back-line. This will mean that you’ll need a stage area of at least 4 metres by 3 metres. What equipment and set up requirements do Robbie Williams tribute acts need? As with most artists who sign up to Entertainersworldwide.com, a Robbie Williams Tribute Act will provide all of their own equipment. You may want to enquire if they need a PA to amplify their sound, in which case we would advise to use our easy to use messaging service to find out. We do ask that each performer gets a backstage area in which they can prepare for the performance ahead. If your venue does not have a backstage area, then we kindly ask that you enquire with the venue to seek an alternative space in which the performer can comfortably get ready to entertain. 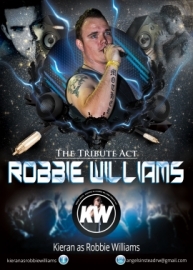 How can you find and book a Robbie Williams tribute Act with Entertainersworldwide.com? 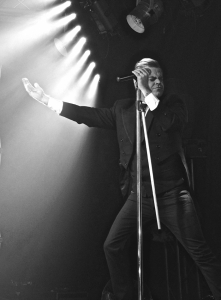 WANT TO RECEIVE A RANGE OF QUOTES FROM Robbie Williams Tribute Acts?